When you are as obsessed with pasta as our Pasta Maker we should never be too surprised with what comes out of the kitchen. However, when The Pasta Maker ventured into the land of striped pasta, we were amazed! First you make as wide a selection of flavoured pasta as you can. For example: carrot, basil, tomato, spinach, kale, squash, beetroot and any natural ingredient that makes the pasta dough colourful. You will notice that the width of each flavours varies and this is what The Pasta Maker chose to do. The next process is to cover the dough to stop it drying out and take slices of workable thickness from the smaller side, seen here on the far right). Begin carefully passing the dough through the pasta machine as if you were making lasagna sheets, finishing on number 5. Alternatively you could roll each slice out by hand. Form 2 sheets of equal length, covering the first one as you work on the next one. Now it’s time to form your ravioli by dabbing the filling onto a lower sheet and wetting the pasta around the filling before covering the lower sheet with the other sheet of pasta. Press around the filling before cutting out the ravioli. Press around each of the ravioli to form a good seal, Flour them lightly and set them aside to dry a little. Roll the pasta out into long sheets as if you were making lasagna, as above. Depending on which direction you would like your striping to be, flour the pasta before rolling it up loosely. We’ve used a plain pasta dough to demonstrate what you need to do next: Cut along the roll to form your fettuccine. This technique is often used in Italian homes because many of those who make pasta don’t extrude it. And in fact, you will not be able to achieve a nice striping using the extrusion method. We hate to waste anything and so with the little pieces of striped pasta left over we formed a few ‘farfalle’. We hope to have encouraged you to become as obsessed with pasta dough as we have …. just spreading the love! 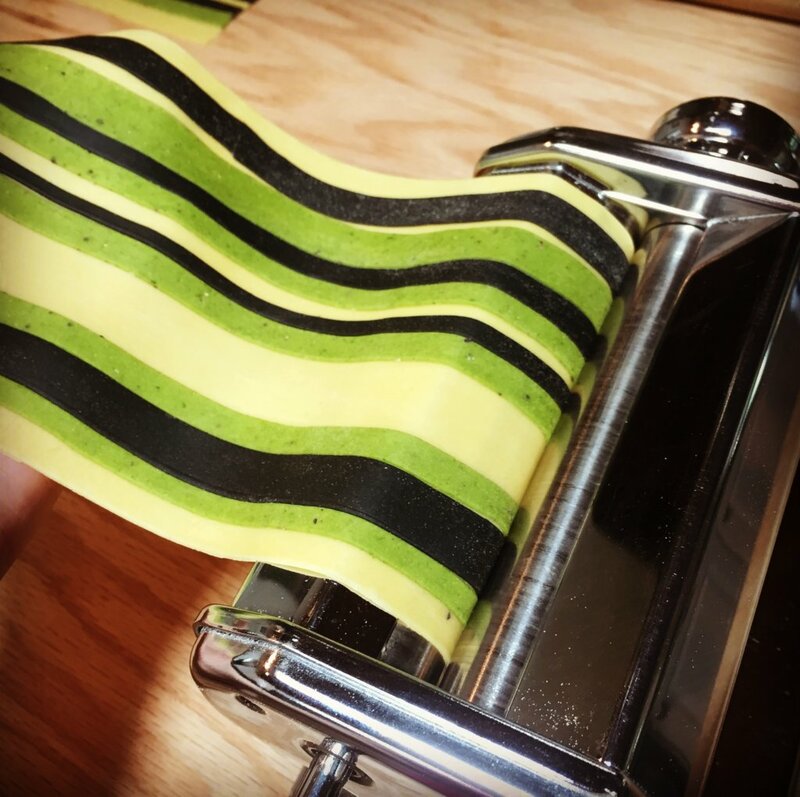 If you would like us to make you some of our striped pasta, we will need some advance notice. Please make your inquiry using the form below.